These different positions mean that the other positions might change in relation to the priest. The liturgical deacon keeps to the celebrant’s righthand side, so will stand behind the altar on the gospel side if the eucharist is celebrated versus populum, but before the altar on the epistle side ad orientem. Traditionally, the credence table is placed to the epistle side of the altar, but that is so it is to the priest’s right when celebrating ad orientem. Many churches have kept the credence on the epistle side even if the eucharist is now celebrated versus populum, while others have moved it to the gospel side so that it remains to the priest’s right. In the first Prayer Book of Archbishop Thomas Cranmer, of 1549, the priest was instructed to stand ‘humbly afore the middes of the Altar’, continuing the ad orientem tradition. Many reformers objected to the word ‘altar’ as well as hiding the congregation’s view of the communion elements behind the priest’s back. Thus, a movable table replaced the old altars and were placed, presumably turned parallel to the length of the church, in either the nave or the midst of the chancel. At the north side, the priest then would still be at the long edge, with the congregation arrayed opposite, to the south, or in the round. It is unclear why north was chosen, but it is perhaps so the Lord’s supper is celebrated from the gospel side. Others have suggested it is so the Reformed rite is proclaimed towards the Catholic South. It is likely that many churches did not follow this rubric if they were so minded and could get away with it. Yet many carried it out with zeal, destroying the stone altar and using a turned table. The east wall of the chancel in these churches often then became a place for the pews of local dignitaries. The Elizabethan Settlement moderated many of the reforming excesses. In 1559, an injunction ordered that whether stone altars or wooden tables as long as ‘the Sacrament be duly and reverently administered’ it was ‘no matter of great moment’. During the early 17th century, the great majority of churches having wooden communion tables not only placed them against the east wall when not in use, but used them there to celebrate communion. The 1662 Book of Common Prayer continues to direct the Communion to be said at ‘the north side of the Table’, recycling the rubric of 1552. Over time, most priest celebrated according to the 1549 rubric, in the midst of the altar facing east. However, the Low Church party continued to follow this rubric even though they too had moved their tables back to east wall. In a very few churches England (though still quite a few in the Church of Ireland), the north-side communion is still celebrated. In this, the priest is at the north, narrow end of the table, facing south, side on to the congregation. Usually, a chair, kneeler and bookstand are placed at the north end for the priest. Another set of chair, kneeler and bookstand is often set at the south end for the parish clerk or Reader to lead the responses. This style has been called various names from ‘lion and unicorn’ to ‘Bill and Ben’. Ever agonizing over how to do Anglican Catholicism in an authentically English manner, Percy Dearmer directed priests to celebrate somewhat diagonally. 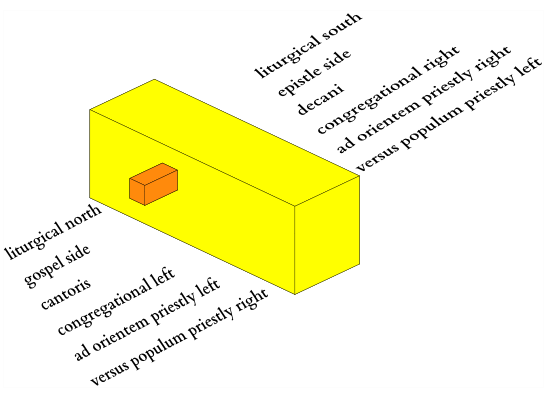 This position was ad orientem, but sufficiently moved to the north along the footpace of the altar that the congregation could see the communion elements and the manual acts. With newer rites, the Anglican churches have overwhelmingly adopted the Roman Catholic lead in celebrating versus populum. It is not surprising that the church has developed its own tradition for naming directions. Sailors have port and starboard so that the direction is not dependent on whether or not one faces the bow (port is left when facing the bow). Sporting grounds often have their specific ‘ends’, like the Pavilion (south west) and Nursery (north east) ends at Lord’s Cricket Ground, or the Gwladys Street (north) and Park (south) ends of Goodison Park. Likewise, actors talk of stage left and stage right, which are always respectively the left and right of the stage if facing out to the audience. Stage left is the same side as house right, the audience’s right, and stage right is house left. As actors look for their prompt from stage left, it is also the prompt side, making stage right ‘off prompt’. In French, this is particularly picturesque, with côté cour (‘court side’) corresponding to stage left and côté jardin (‘garden side’) for stage right (this dates from when the Comédie-Française was ensconced in the Salle des Machines of the Palais des Tuileries with a stage between the Cour du Carrousel and the Jardin des Tuileries). In the fast-paced world of heraldry, there is a steep learning curve, mostly to do with the arcane language of blazon, used to describe heraldic arms. The Latin words dexter and sinister, meaning ‘right’ and ‘left’ respectively, are used to describe the vertical halves of the shield. However, they are the right and left according to a knight bearing the shield. Thus, dexter is the viewer’s left, even though it literally means ‘right’. I’m sure there are all sorts of folk tales about why this arrangement is so. I’ve heard things about leaving the groom’s sword arm free to defend his woman, which rings bells on my bovine-waste detector. It is more likely a patriarchal statement that the groom is on the right. I have an additional “viewpoint” re: the position of the Groom/Bride in weddings. As an organist and frequently in the “West Balcony”, I had played many weddings prior to my own wherein my view was completely reversed in the mirror on the organ console. When I was told where to stand, i was “reluctant” as i thought this was incorrect ….Backwards (or mirror universe) to my previous experience…Oy veh! Thanks for that thought, Jimmy!